I saw Nnamdi Asomugha’s name attached to this film as a producer, and I simply assumed that he fronted the money for a film that he was passionate about, a story about black men and over-incarceration and racial justice that he felt inspired to help reach an audience. Asomugha is a name you might recognize if you’re a fan of NFL football; he played 11 seasons, mostly for the Raiders, and was quite good. I watched the entire movie before I realized that he was basically the star of the film. That blew me away; I has mentally commented that this actor was great, that I hadn’t seen him before, and that I wondered who he was. It’s surprising that he’s a ball player turned actor, but what’s more shocking is that you would never know. In the 80s, America’s crime problem was streaming out of hand, and lawmakers saw only one way to stop the tide; laws. Harsher sentences, more time, extra arrests, clean the streets, and it was African Americans in low-income areas who felt the pressure most acutely. Colin Warner was an opportunistic thief, but he was not a violent criminal, and when his name was mentioned in connection with a murder, he was picked up and charged before he even knew what hit him. The police didn’t care who went to jail, they just needed bodies in cells, and Warner was the unlucky, innocent man who paid the price. Over the next 20 years, his friends and family would fight for justice, while Colin’s life flowed past before the bars of his prison door. This is a true story, and it has one hell of a punch. Here is an innocent man who wasted his years behind walls because the system was in a hurry to convict, to toss black men in jail as a group to show a semblance of progress against crime. If he had lived in a state with the death penalty, Warner would have been killed, his life would have taken from him even more than it already was. I would say that this issue goes beyond politics, that we as humans could agree that this is wrong, but I’ve overestimated Republicans before, so I won’t make the mistake of assuming that they would care. But you might, and this film could make a big impact. Diving into the film itself, the acting is very strong; Stanfield as Warner and Asomugha as his best friend KC. Nnamdi stole the show, but the script was a definite aid, as was the pace of the movie, which helped support the actors in a way that you don’t see enough. 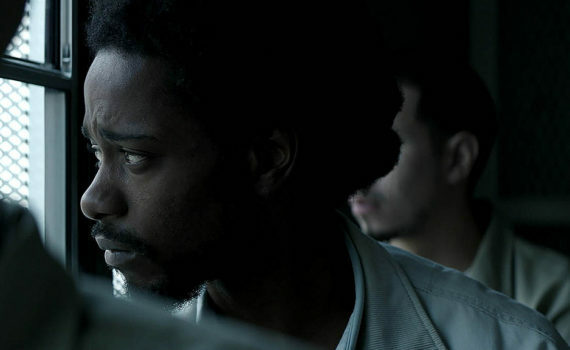 Crown Heights is one of the most powerful plots of the year, and I just hope it doesn’t slide under the radar.